This article has been created in order to explain what is the BackSwap Trojan and how to remove this malware completely from your computer. The BackSwap Trojan is a dangerous virus that has successfully hijacked hundreds of computers. In our removal guide computer users can learn more about its mechanism of infiltration and operation, as well as the necessary steps to remove active infections from compromised hosts. Short Description Silently infects the target machines and modifies key applications and system services. Symptoms The user may not experience any signs of infiltration. User Experience Join Our Forum to Discuss BackSwap. The hackers behind the threat were able to target transactions that range from 10 000 to 20 000 PLN which equals to amounts between 2680 to 5363 US Dollars. Software Installers — The hackers choose popular applications that are often installed by end users. Examples include creativity suites, system utilties, office and productivity tools and even computer games. Documents — Using a similar method the targets can infect documents of different types: rich text documents, spreadsheets and presentations. Usually this is done by inserting malicious scripts (macros) that when enabled will start the infection. It is also possible for victims to infect themselves via browser hijackers — malicious web browser plugins that are usually distributed on the relevant plugin repositories. The hackers utilize fake developer credentials and user reviews in order to manipulate the users into believing that it is a legitimate instance. The most common behavior tactics modify the default settings in order to redirect the users to a hacker-controlled site. Once this is done tracking cookies can be deployed in order to spy on the victims and afterwards the BackSwap Trojan is installed. Once the virus file is deployed to the victim hosts the infection is started. The security analysis shows that the associated malicious engine has a different mechanism of hooking to system and user-installed applications. This is done by simulating user input instead of interacting with the built-in functions. The BackSwap Trojan therefore does not need to have a specific instructions set for the different architectures. This type of malicious threat is classified as a banking Trojan and as such interacts primarily with web browsers. Usually the most popular ones are made compatible: Mozilla Firefox, Google Chrome, Internet Explorer, Microsoft Edge, Safari and Opera. The malicious engine generates event hooks that similate actual human behavior. It is also loaded with strings that showcase potential online banking activitiy. There are several behavior events that can suggest potential banking activity: opening of bank-specific URLs, browser tabs, bookmarks, entering of two-factor authentication credentials and etc. The security experts note that Mozilla Firefox and Google Chrome include security measures that protect against self-XSS attacks. However due to the fact that that the BackSwap Trojan simulates letter-by-letter keyboard input and copy/paste operations much of these techniques are automatically mitigated. Whenever an active online banking session is detected the associated virus engine will hijack the transactions and modify the entered values in order to change the recipients. This happens in an automatic manner and the users have no way of controlling it. WARNING! It is very possible that future versions of the BackSwap Trojan can exhibit new behavior strains and further adding other modules. In order to fully get rid of this Trojan, we advise you to follow the removal instructions underneath this article. They are made so that they help you to isolate and then delete the BackSwap Trojan either manually or automatically. If manual removal represents difficulty for you, experts always advise to perform the removal automatically by running an anti-malware scan via specific software on your PC. Such anti-malware program aims to make sure that the Grobios is fully gone and your Windows OS stays safe against any future malware infections. Threats such as BackSwap may be persistent. They tend to re-appear if not fully deleted. A malware removal tool like Combo Cleaner will help you to remove malicious programs, saving you the time and the struggle of tracking down numerous malicious files. Threats such as BackSwap may be persistent on your system. They tend to re-appear if not fully deleted. A malware removal tool like SpyHunter will help you to remove malicious programs, saving you the time and the struggle of tracking down numerous malicious files. Note! Your computer system may be affected by BackSwap and other threats. SpyHunter is a powerful malware removal tool designed to help users with in-depth system security analysis, detection and removal of threats such as BackSwap. 1. Install SpyHunter to scan for BackSwap and remove them. 2. Scan with SpyHunter, Detect and Remove BackSwap. Ransomware infections and BackSwap aim to encrypt your files using an encryption algorithm which may be very difficult to decrypt. This is why we have suggested several alternative methods that may help you go around direct decryption and try to restore your files. Bear in mind that these methods may not be 100% effective but may also help you a little or a lot in different situations. Note! Your computer system may be affected by BackSwap or other threats. Remove BackSwap by cleaning your Browser and Registry. Fix registry entries created by BackSwap on your PC. Combo Cleaner is a powerful malware removal tool designed to help users with in-depth system security analysis, detection and removal of threats such as BackSwap. Step 5: In the Applications menu, look for any suspicious app or an app with a name, similar or identical to BackSwap. If you find it, right-click on the app and select “Move to Trash”. Step 6: Select Accounts, after which click on the Login Items preference. Your Mac will then show you a list of items that start automatically when you log in. Look for any suspicious apps identical or similar to BackSwap. Check the app you want to stop from running automatically and then select on the Minus (“–“) icon to hide it. Remove BackSwap – related extensions from your Mac’s browsers. A pop-up window will appear asking for confirmation to uninstall the extension. Select ‘Uninstall’ again, and the BackSwap will be removed. When you are facing problems on your Mac as a result of unwanted scripts and programs such as BackSwap, the recommended way of eliminating the threat is by using an anti-malware program. Combo Cleaner offers advanced security features along with other modules that will improve your Mac’s security and protect it in the future. Hey !, I found this information for you: "BackSwap Trojan — How to Remove it From Infected Hosts". 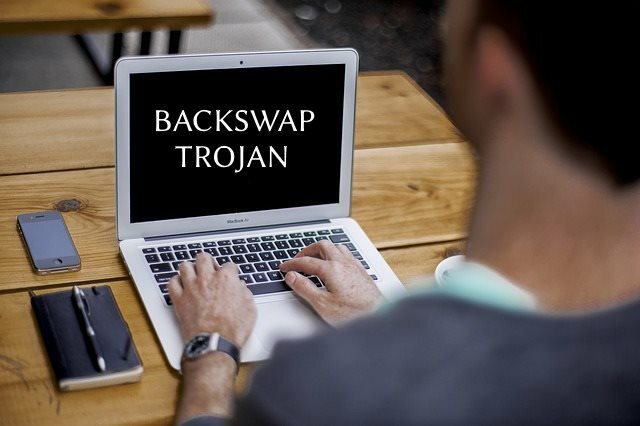 Here is the website link: https://sensorstechforum.com/backswap-trojan-remove-infected-hosts/. Thank you.